The1994 Stanley Cup Final was abest-of-seven playoff series contested between theEastern Conference champion New York Rangers andWestern Conference champion Vancouver Canucks of theNational Hockey League. Pre-owned item. JAGR JERSEY. This one has no major stains and no holes. This one features heat pressed on letters and numbers/logos on the front and back.This one does not have the shoulder patches (photo 10). This is blue / red / white - very high quality ! New York Rangers Bottle Cap Wall Sign - Distressed - Room Bar Decor Metal 13.5"
A great gift idea for any fan. Christmas is just around the corner! Team logo design! 100% acrylic. 60" long and 6" wide. A great gift idea for any fan. Christmas is just around the corner! We will be glad to rectify any problems you may have. New York Islanders Stanley Cup Champions Flag 3ft x 5ft Polyester NHL Banner.This polyester flag feature's team graphics. 100% polyester construction. Team colors and logos on one side. NEW YORK RANGERS. Hockey jersey. Overall length: 76 cm. Very good condition! Shirt have micro pulls. CONDITION DETAILS. Although my prices may seem at a premium, they are more than fair. You want them?. They are here. Fabric intact. • New Era low profile 59Fifty fitted cap. Color is Blue. • Diamond era performance fabric. • Rubberized beveled front logo. THIS PRO-PATCH CREST LETTER KIT IS SEWN PROFESIONALY WITH PRO ZIG-ZAG STITCHING WITH PRO-TACLE TWILL. YOU CAN SAVE MONEY AND BUY FROM OTHERS OR YOU CAN BUY QUALITY CREST FROM US. AND WEAR WHAT THE BIG BOYS WEAR ! HUGE NEW YORK RANGERS IRON-ON PATCH - 3" x 9.5"
3" x 9.5". There is no sewing involved with this high quality tackle twill patch. All you have to do to apply, is use your iron, set at 375 degrees. These would be great for applying to things where sewing is not an option, such as a golf bag, book bag, suitcase, scrapbooking, room decor, etc. This puck is new but over time the clear coat film seems to have separated a bit. Mostly on the back as the picture side is pretty solid. Great rare photo puck from 96. Players consist of 3 left grip attackers, 2 right grip attackers, and 1 goalie. NEW YORK RANGERS. IDEAL FOR YOUTH BOYS OR GIRLS. Make Supersized Seem Small. Raglan Sleeves. Machine Wash Cold Tumble Dry Low. 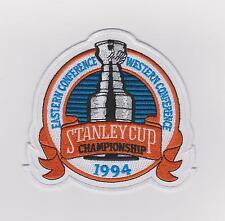 This large authentic embroidered collectible patch was seen on the jerseys/sweaters of the New York Rangers & Vancouver Canucks during the 199 4 Stanley Cup Final. Official NHL product is the answer to any hockey fan's collection. New Minor Flaw - There is a split on the paint on the Reebok logo. Very minor (see photos).